For a long time, whenever anyone asked what wildlife lived near me, I always used to say that there were no badgers nearby. Even though I had often seen badgers dead by the motorway, about 15 miles south of here, I always assumed that there weren't any nearby. I had asked the local gamekeepers, all of whom denied seeing anything nearby, and I had kept my eyes open but never saw anything even close. 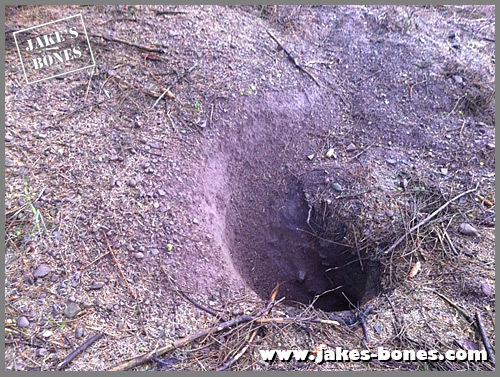 Even after I found the dead badger about a mile from my house, I didn't get much further. It was only in the last few months that I decided to take a closer look...and this is what I found ! 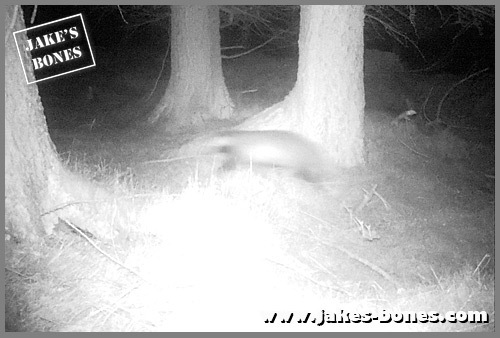 It wasn't very clear, but if this wasn't a badger, it certainly looked like one ! The trail camera was in the same wood for about a month after that, but didn't pick up anything else. . Had I been wrong ? I almost gave up, but the next place I moved the camera to was a path in trees which ran east-west from an open field to one of the thicker woods. I could tell it was used a lot, and could see deer footprints, but was it used by badgers as well ? I left it there for a week. It filmed deer - which I expected - then it filmed another four legged cloven-hoofed mammal I didn't expect to see at all ! 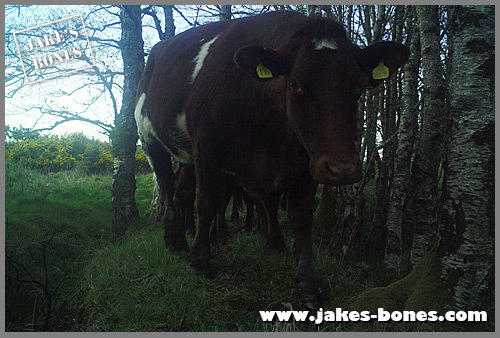 A herd of cows had broken out of the field next door, and were loose in the woods. It even filmed the farmer chasing them back in ! 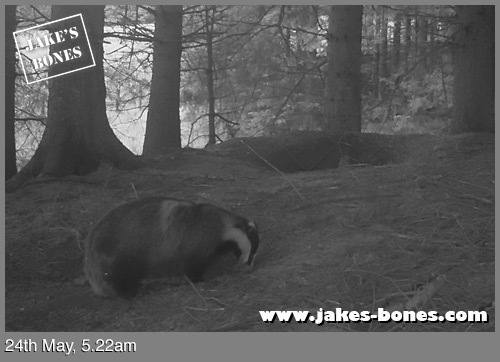 I couldn't quite make it out, but it walked like a badger, was about the right size, and was filmed early in the morning (about 4am). 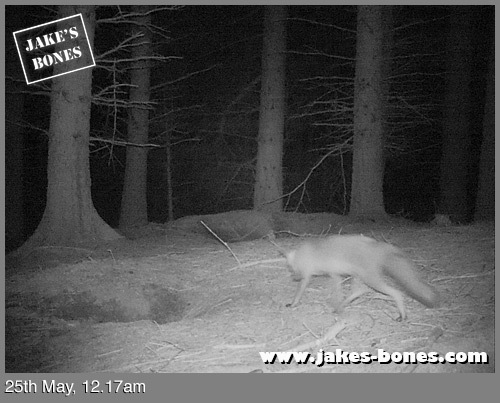 Then as I checked through the trail cam footage I found this still from a few days later ! 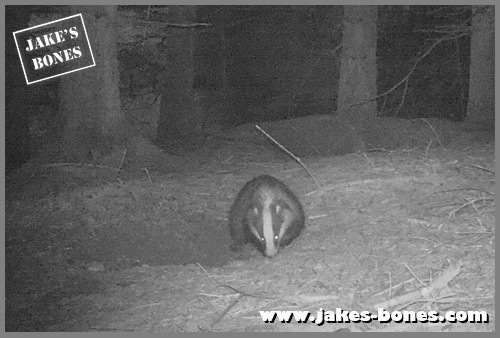 It filmed the badger heading east along the path at 10pm one night, then back west at 4.38am the next morning. 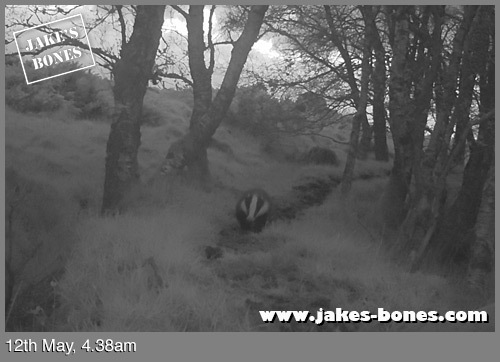 These times were close to sunrise and sunset, so from this I guessed the sett was west of the trail camera, but not too far away. Of the four woods in that area, I know three of them quite well, and one not very well, so I started with the one I didn't know so well. I was looking for multiple tunnels in a hill close to open land. The wood to the north, which I didn't know as well, I drew a blank. I couldn't even find any tracks nearby. Then I searched the western wood. It was difficult, because there were many fallen trees making most of it difficult to explore. 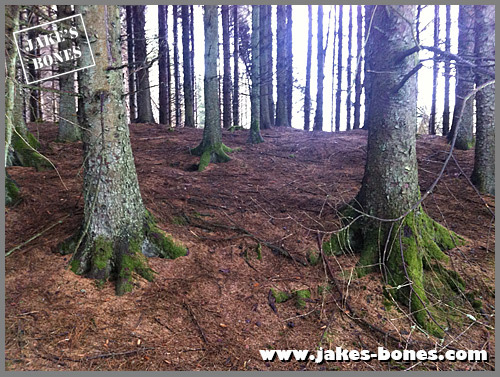 Then at the last minute, I remembered an area of that wood where I had written this blog post. I remembered there was a raised area in the wood, and searched for it. I almost couldn't find it, because it was well hidden, more than I remembered it. I looked around. There were lots of tunnels, the soil was dry (but surrounded by marshy ground) and some of the tunnels had spoil heaps outside which were freshly dug. Was this the spot ? There was only one way to find out. I left my trail camera there for a few nights. You can see it here on the left. It was difficult to know which hole to aim the camera at, but I focused the camera on the newish holes. 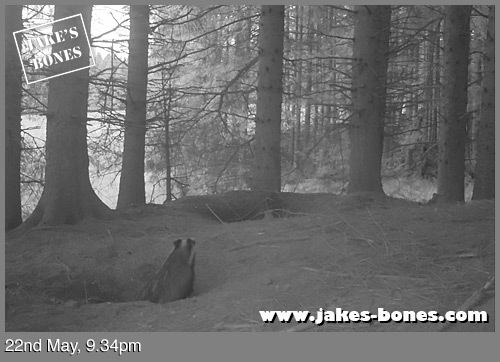 After a few days, I went back, as far away from sunset or sunrise as I could manage, so not to disturb the badgers. And a fox. Could this be a fox den ? And the other one ? That must be the mother....because she had three cubs ! If this next video isn't the cutest thing you have ever seen then I don't know what is ! 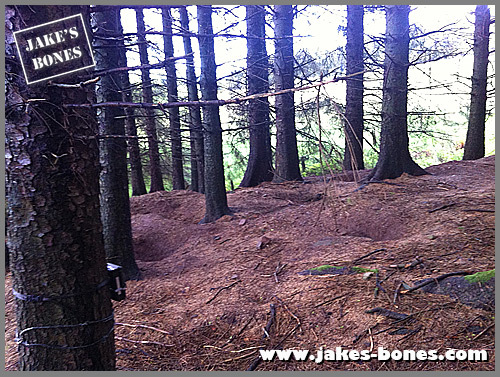 So this is my big project at the moment, filming the sett, and trying to understand the badgers. They have a good routine, and it's great observing them. A lot of naturalists my age have been observing badgers near them for a while (like Georgia Locock), but this is all new to me, and I'm really looking forward to it ! Great little videos. Lovely to see the badgers. Badgers are fascinating animals. I hear there is quite a bit of prejudice against them in the UK. They face an uphill battle in the western USA as well! 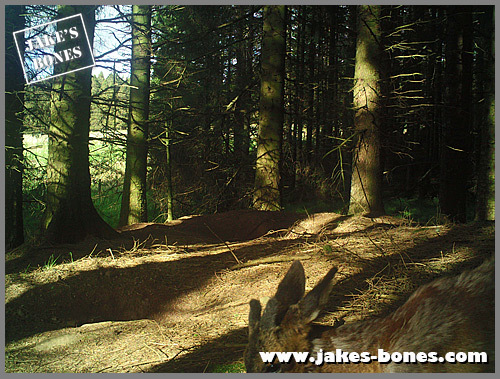 It was a brilliant feeling seeing them for the first time on the trailcam. There is. A lot of beef and dairy farmers really don't want them on their land, but they are protected species.